The Most Powerful and Super Easy to Use Fashion & Clothing Design System In The World. Design Your Own Clothing Line Today! Create Amazing Professional Fashion Sketches In Minutes Even If You Can’t Draw! Start Designing Your Own Clothing Line, Fashion Collection and Manufacturer-Ready Sketches Today With Digital Fashion Pro! * System Features: Step by Step Training, Hundreds of Clothing Templates, Models and Digital Fabrics Wrapped in One! * Design Your Own Men’s & Women’s T-shirts, Jeans, Dresses, Shirts, Sweaters, Handbags, Leggings, Jackets, Shoes, Kid’s Clothing & More! 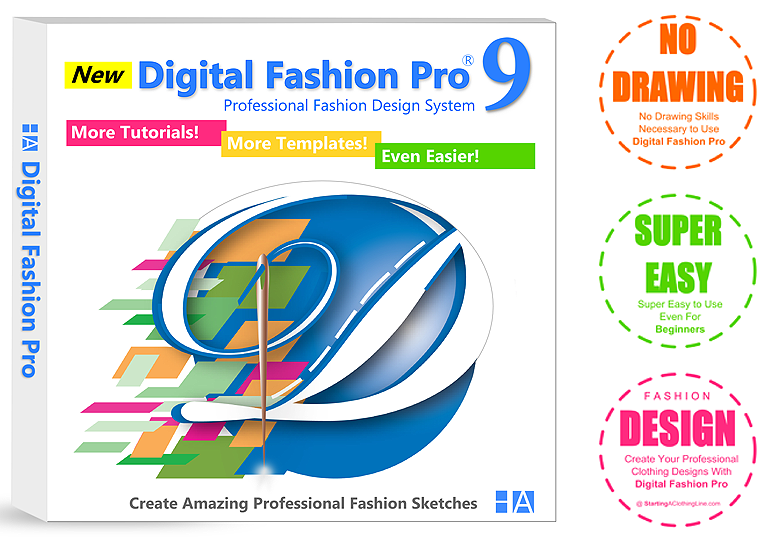 Digital Fashion Pro V9 is a powerful CAD Fashion Design Software System for today’s professional and aspiring fashion designers who want a program that can design cutting edge designs without limitations at a great price. Digital Fashion Pro is SUPER EASY TO USE plus it delivers professional fashion illustrations that are above & beyond industry standards. Digital Fashion Pro is used by hundreds of schools, companies, designers & beginners around the world. So whether you’re an established fashion designer or company, fashion teacher / school, or even just a true beginner trying to realize your fashion dreams – Digital Fashion Pro can help you accomplish your fashion objectives in a way unlike any other tool or method can! No sewing or drawing skills required to use! Digital Fashion Pro allows you to design clothing like a pro! Digital Fashion Pro was created to give you the ability to design any fashion style you want easily and effectively, even if you have no prior experience. It comes with simple / easy to follow instructions that will teach you how to design clothing in stride. It creates manufacturer approved fashion sketches so that you can send your clothing sketches to your apparel manufacturer with ease and confidence so they can make your clothing line. Create great looking, highly detailed fashion sketches in minutes right on your computer! Digital Fashion Pro can be used by anyone, anywhere in the world. Whether your design aesthetic is clean and simple, classic, edgy, slogan driven or consist of beautiful prints – Digital Fashion Pro has you covered. You can now begin designing the clothing collection that you have been envisioning. 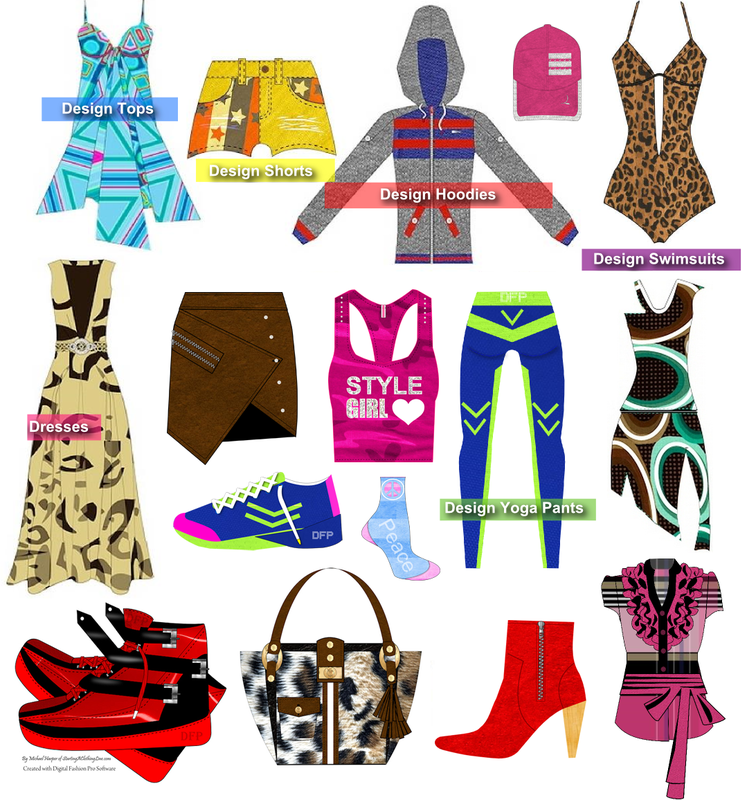 Get your fashion ideas out your head and into the real world with Digital Fashion Pro Today! Order the incredible Digital Fashion Pro System below. 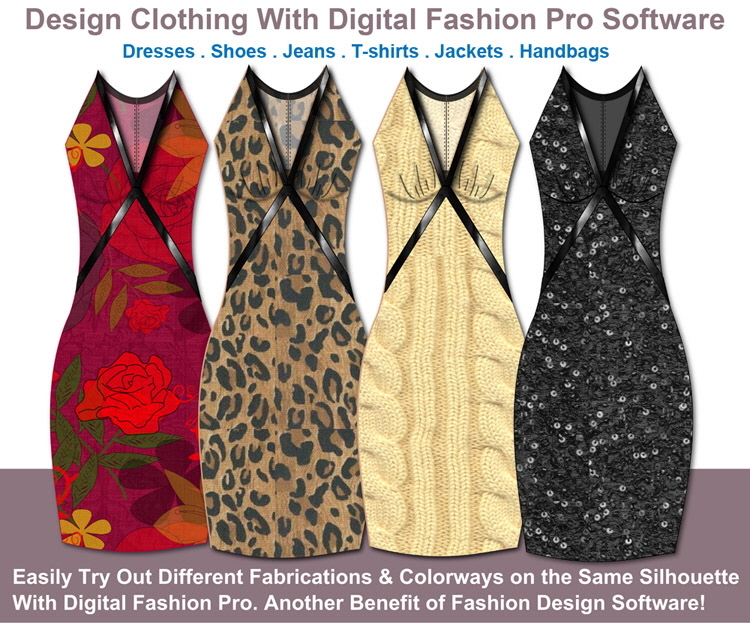 Design Any Type of Clothing Style With Digital Fashion Pro Basic & Upgrades! While Basic comes with vast library of Men and Women’s Clothing Templates for T-shirts, pants, shorts, polo’s, tanks, leggings, basic tops, buttons, pockets, hangtags & hardware – the expanded Library Packs & Upgrades allow you to design additional styles of clothing like Dresses, Coats, Shoes, Handbags, Yoga Pants, Trendy Women’s Tops, Hats, Swimsuits, Lingerie, Underwear, Bras, Sports Tops, Jackets, Vest, Hoodies, Cardigans, Sweaters, Jogging Suits, Costume Designer, Business Attire, Scarves, Eyewear, Socks, Baby / Children’s Clothing and more. 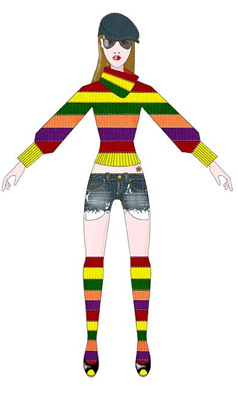 As a complete system (Basic + Upgrades), DFPro fashion design software can pretty much design any clothing style. 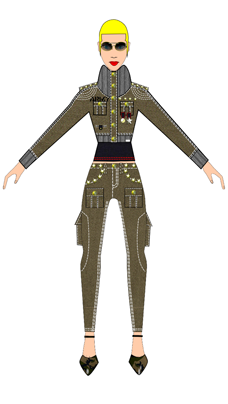 Model Templates: After designing your clothing you can put them on the included Digital Fashion Pro female and male model templates to get the total look for your styles. Models come in a variety of skin tones, hair style files etc. that you can customize any way you want. Models come in front and backside view as do the clothing templates. We also offer Runway, Red Carpet and Side Model Poses as optional upgrades. Create Couture, High Fashion, Active Wear, Ready-to-Wear, Outerwear, Urban, Sleepwear, Streetwear, Skater, Wearable Tech Garments, Costumes & More! So stop procrastinating and start designing the fashion line you envision. There is no better time than now! 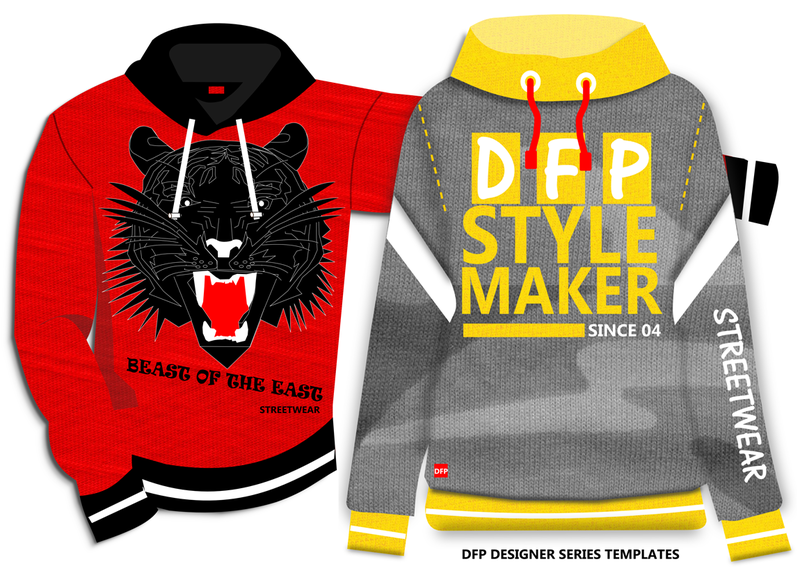 Thousands of Customizable Vector Clothing Templates! Design For Men, Women, Kids, Toddlers, Shoes, Handbags etc. Expandable with optional upgrades – Design Any Clothing Style! You order it here – it gets delivered to your door. You install it! You design! How Does Digital Fashion Pro Work? 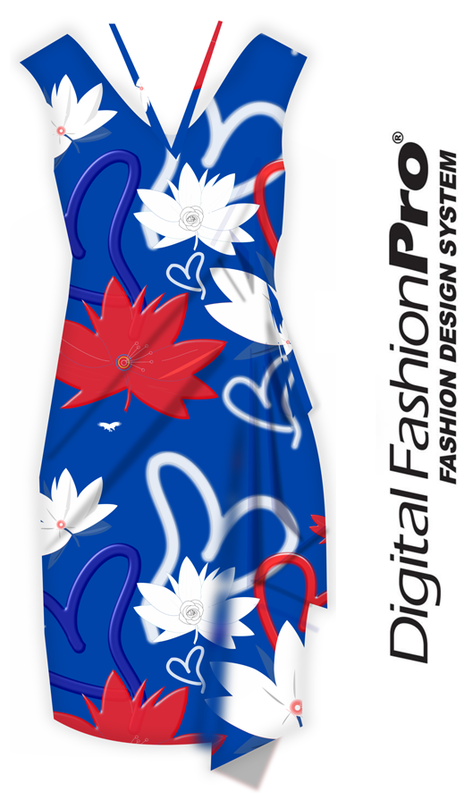 Digital Fashion Pro Clothing Design Software System – is a complete all-in-one professional system featuring a basic fashion design course (training), collection of custom built vector garment templates (front and backs), hangtags, pockets, hardware, models, design techniques, Digital Fabric and an independent graphics application provided free of charge that when combined create realistic looking clothing sketches that resemble actual garments. You just install Digital Fashion Pro plus the free graphics application provided on your computer and you are ready to go! Digital Fashion Pro was created by fashion designers which is why the program delivers everything a fashion designer needs to be successful at designing, and accomplishing all of the standard processes involved in creating and producing a clothing line. Digital Fashion Pro is more than a software – it is also a true fashion design course that teaches you the skill of designing and fashion illustration. Digital Fashion Pro can be used to create technical sketches such as the sketch shown below. Technical Sketches along with regular fashion sketches (both created with precision with DF-Pro) are the foundation / first step in getting your clothing line made at a clothing factory. Your regular Fashion Sketch, Technical Sketch and Specification Sheets are the items needed by your manufacturer or seamstress in order for them to make your clothing. Digital Fashion Pro, Beyond the Basics Upgrade + Our Fashion Business Center can help you get your clothing designs in the approved manufacturing format. Read article on how to start a clothing line. We teach you how to create technical sketches on the Spec Tutorial located the Beyond the Basics Upgrade. If you need a better understanding of the fashion design process / garment measurements etc. – please read this article: The fashion design process – how to send sketches to manufacturers and get your clothing made. You can even design your labels and buttons with Digital Fashion Pro. Together these items make up your tech pack. Manufacturers need your tech pack in order to begin manufacturing your clothing line. The Fashion Mogul Package can help you start, build, design & launch your own fashion brand. Digital Fashion Pro is used by some of the leading Professional Fashion Designers, Clothing Lines, Design Companies, Aspiring Fashion Designers, Costume Designers, Fashion Students, Freelancers, Stylist, Graphic Artist, Colleges, High Schools and true beginners in fashion. Many of our education sector clients teach and use DFP in their CTE and FCS Apparel Design Classes. Digital Fashion Pro is currently taught in over 300 high schools and colleges. We are very proud that our resources help and aid our diverse client base. 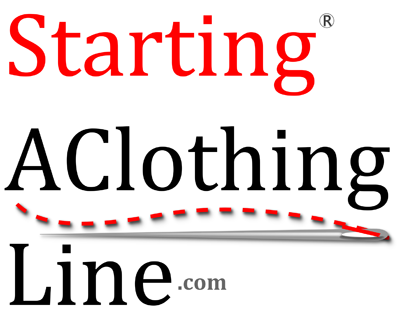 StartingAClothingLine.com supports numerous charities such as Dress For Success, YouthVille, The Children’s Gallery & Art Center, Sew Creative Preparatory, Inc., Fashion Arts & Youth Enterprises Inc., After-School All-Stars, Los Angeles and many more. Order Digital Fashion Pro Today To Save! SUPER 1 DAY SALE – On 5 Packages! Save Up to 50% Off! + Use Discount Coupon: LineStart Today! Order With Confidence – Safe & Secure Ordering Protected by GeoTrust SSL. Tracking Provided. 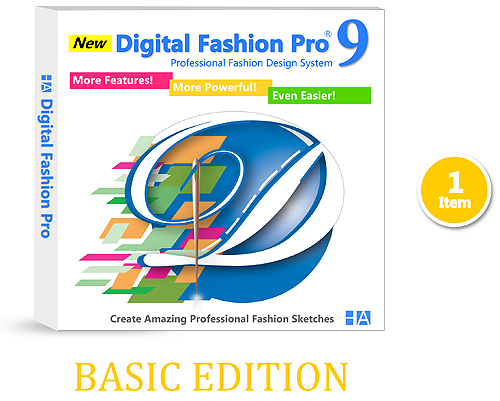 1) Buy: Digital Fashion Pro V9 Basic – 2019 Edition – 1 Item. Just $199 Right Now During Our Super Sale! Regularly $399. This Package Designs Basic Pants & Tops Only. See Other Package Below to Design More / Added Features. * Templates to Create Regular, Skinny Jeans, Leggings, Straight Leg, Wide Leg, Capris, Low Rise, High Rise! On Sale Right Now For Just $199! Order Now To Save Big! Regular Price $399. Sale price & offers are subject to change without notice & are not guaranteed to last all day..
2. Digital Fashion Pro V9 Business Class Edition 2019 Edition – 4 Items! Get The Basic Version + 3 Upgrades! On Sale Today For $299 During Our Super Sale! Regular Price $574. 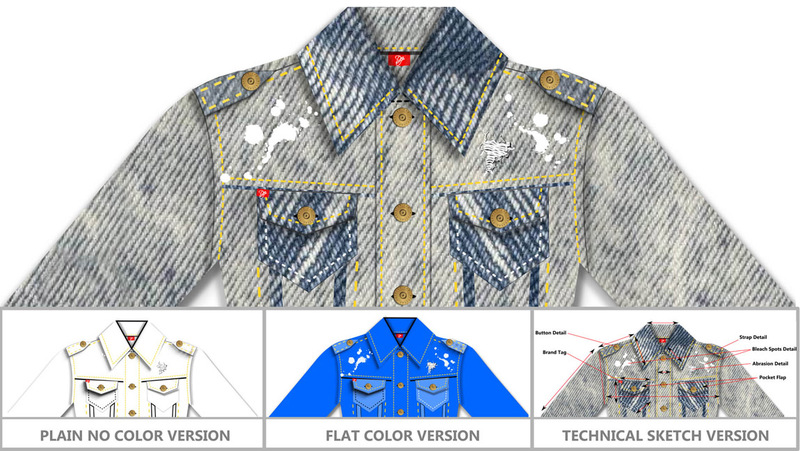 Get All The Basic V9 Edition Features: Templates for Jeans, T-shirts, Pants, Shorts, Polos, Tank Tops, 2 T-Shape Model Poses, 105 Digital Fabrics, Step by Step Training + Ability to Design Dresses, Skirts, Hoodies, Coats, Jackets, Sportswear, Sweaters, Tops, Button Downs, Swimwear, Baby Clothing + 1400 Extra Digital Fabric Files + How to Create Technical Sketches & Work With Artwork / Graphics Training. You will love designing with our Clothing Design Software! Perfect for Menswear, Women’s Wear, Children & Baby Apparel. 4. Digital Fabric Library Upgrade ($125 Value) – Get 1400 more Digital Fabric Files Like Leather, Denim, Silk, Knits, Prints, Cotton, Suede, Rhinestones, Metals, Camo, Plaid, Thermal, Wool, Fur, Snakeskin, Animal Prints, Velour & More. + You can even add your own fabrics, prints & artwork. On Sale Today For $299 During Our Super 1 Day Sale! Get All The Features of Business Class Edition + Ability to Design Dresses, Skirts, Hoodies, Coats, Jackets, Sportswear, Sweaters, Tops, Button Downs, Swimwear, Baby Clothing + 1400 Extra Digital Fabric Files + How to Create Technical Sketches & Work With Artwork / Graphics Training. 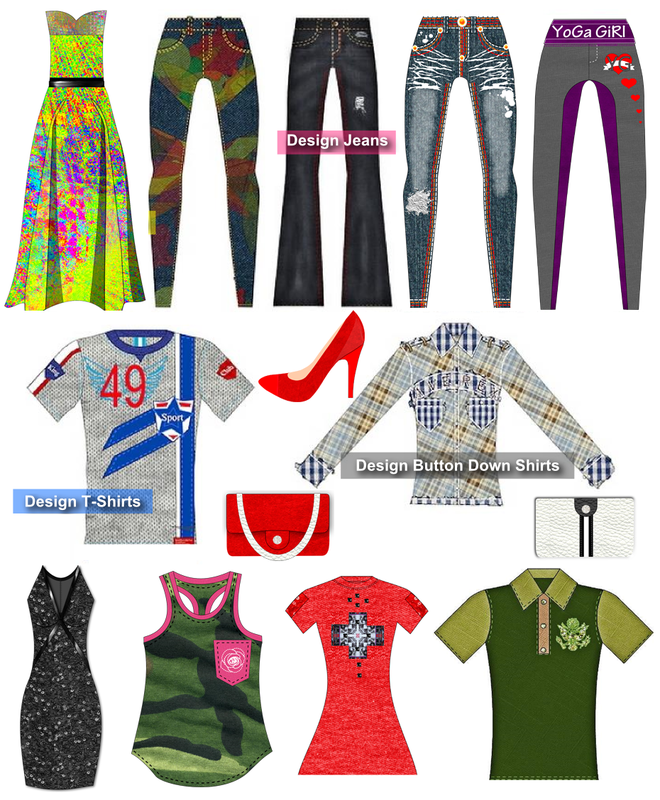 You will love designing with our Clothing Design Software!Design Men’s and Women’s: Tops, Pants, Shorts, Leggings, Dresses, Skirts, Coats, Jackets, Suits, Swimwear, Lingerie, Sportswear, Baby & Kid Clothing, Hangtags, Buttons, Shoes, Heels Boots. + How to Make Technical Sketches + Advance Fashion Design Software Training. This package is Perfect for clothing line designers – it gives you the extra knowledge to handle the technical side of designing your line. Plus you get the red hot Denim Wash Factory to enhance your jean designs. On Sale Today For $349 During Our Super 1 Day Sale! Regularly $824. 4. The Fashion Mogul Clothing Line Start Kit – 2019 Edition – The Ultimate Design / Business Package! 10 Items! Includes Digital Fashion Pro Industry Edition + The Start a Line Business Kit! Turn Your Fashion & Style Ideas Into Products To Sell Under Your Own Fashion Brand With This Package! Are you ready to launch your own line and take the Fashion World by Storm? 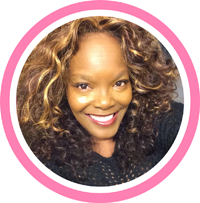 The Fashion Mogul Package of Design & Business Tools will walk you step by step through starting your own clothing line, designing it, getting it made and in stores! Arm yourself with the best design & fashion business tools on the market! 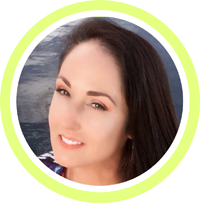 Don’t miss this incredible opportunity to save and get the most powerful fashion entrepreneurship tools available for clothing line owners and designers. You will get Digital Fashion Pro Industry Edition V9 (6 Items) + The Official Step by Step Guide to Starting a Clothing Line Book + The Ultimate List of Manufacturers eBook – 500 Manufacturers that can make your line. List includes apparel manufacturers from over 15 countries like USA, UK, Australia, Canada, China, Hong Kong, Japan, Italy, India & More! + The Fashion Business Center which features Spec and Line Sheet Templates, tutorials and more! + Get Digital Fabric Pack X. Even if you have never designed before or you’re a beginner – this package will get you where you want to be with your line. 6. There are so many benefits of having this package that we can’t name them all! Note: When purchasing this package – 10 items (USB with 9 items on it + Official Step by Step Guide to Starting a Clothing Line Book) will come in the mail to you. Ships Between 2 – 3 Business Days After Order. Tracking Provided. On Sale Today For $475 During Our Super 1 Day Sale! 5. The Style Blast Package 2019 Edition – 18 Items! Design Over 1,000 Styles! All Of Our Fashion Design and Business Items In One Package! 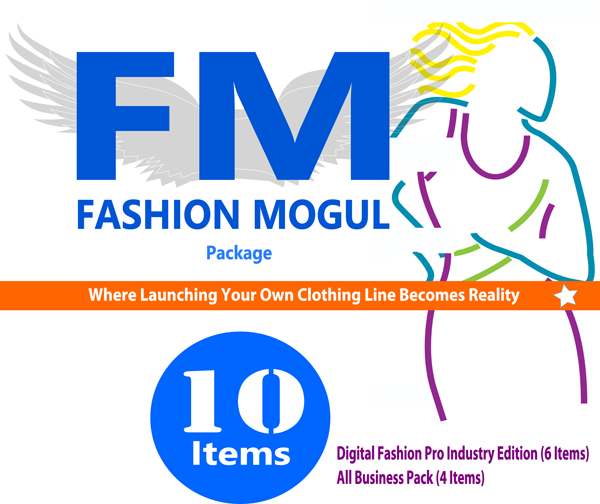 This package includes Everything In The Fashion Mogul Package Plus 8 Additional Items!. Do it all with this incredible fashion design and fashion business package. Get The Luxury Edition of Digital Fashion Pro which includes Industry Edition + 8 additional upgrades + It is ON SALE TODAY! Get Everything In The Fashion Mogul Clothing Line Start-Up Package + 8 More Items: Storyboard Creator Upgrade (Features 2 Extra Models – Runway & Side View Pose + Supporting Templates) + Dress 2B Upgrade, Mega Vector Art Pack (200 Art Files to Use In Your Designs) + Digital Prints Pack Fabrics + Red Carpet Pose & Supporting Templates + Women’s Heels 2 Upgrade + Style Pack 2 Upgrade (Rompers, Wrap Dresses, Blouses) + Unisex Dress Suit Jackets & Blazer Collection.. Note: When purchasing this package – 18 items (USB with 10 items on it + Official Step by Step Guide to Starting a Clothing Line Book) will come in the mail to you. The other 7 Electronic items will be sent to you via email download after product registration / verification. Product Ships From The USA Within 2-3 Business Days of Order – Tracking Provided. On Sale Today for $675 During Our Super 1 Day Sale! 14 YEARS OF EXPERIENCE. REAL SUCCESS STORIES. I`m pleased to share the joy with you that my dreams from scratching on papers have finally come to an end! I`m a single mom with a 5 year old boy. I work and I do so many activities with my son. Still I manage to keep up with my dreams of one day becoming a successful Designer. I`m almost getting there because my work has become so much easier through Digital Fashion Pro as I`m now able to let my ideas flow in all the direction and in only a few minutes. — Keith G., Los Angeles, CA. — Philip T. London, Ontario. — Harvey O., Washington, D.C.
“I like the fact that I was also able to add a few fabrics that I already had to the system. I was also able to scan in some of my sketches and retrace them in the system to give them an added presence. Digital Fashion Pro is wonderful! “I felt I was taking a chance buying this product when I bought it because there wasn’t a online demo for me to watch. But I said, what the hell — it’s only $199 bucks and that isn’t going to kill me. But once I saw the video tutorials and I was able to make my own design within minutes, I realized that buying Digital Fashion Pro was the best decision I ever made! If you have a Digital Fashion Pro testimonial you want to share with the world, feel free to write us. We truly thank you for your feedback! Digital Fashion Pro / StartMyLine.com / StartingAClothingLine.com supports numerous charities & community programs such as Dress For Success, YouthVille, The Children’s Gallery & Art Center, Sew Creative Preparatory, Inc., YoArt Inc., Fashion Arts & Youth Enterprises Inc., After-School All-Stars, Los Angeles and many more. Digital Fashion Pro / Harper Arrington Publishing Client List: Here is a list of some of our Academic Clients. Clients listed either have our software, books or both. See disclaimer at the bottom of the list. Disclaimer: This list is not to be taken as endorsements of any of our products or services. It is simply a partial Harper Arrington client list. Most of our clients are Digital Fashion Pro users but some are Harper Arrington Fashion Book Clients. Although we have published some of our client list on our website, it is not meant for individuals to contact and disturb our clients to ask them for reviews or what items they purchased from us. They have asked us to ask you to respect their privacy. We will do the same for you when you become a client. If you are not sure about any of our products and need additional information – E-mail us or visit our Contact Page. Thank You for your cooperation. Schools & Teachers For More Information on Bringing Digital Fashion Pro to Your School: Visit Academic Page. Orders must be signed for at the billing address. We only ship to confirmed Billing addresses. Ship to and Bill To Must Match Credit Card Billing Address. Orders Ship Out Via USPS within 2 to 3 business days. Transit time based on chosen shipping method during checkout. FYI: Your purchase is 100% tax deductible as a business expense if you already have a business on record or if you start your fashion business this year! If you don’t have a business, LLC or D.B.A. set up yet don’t fret – Our How to Start a Clothing Line Course will show you exactly how to get things set up! Therefore, you have nothing to lose but everything to gain! Kick off your fashion career today!. Legal Disclaimer: Nike Logo belongs to the Nike Corp. All Rights Reserved. Nike is a registered trademark of the Nike Corporation. No other claims, endorsement or ownership claim is made to Nike or Nike Logo. Jacket apparel design featuring Nike Logo was designed by Michael H for illustration purposes only using Digital Fashion Pro Fashion Design Software.